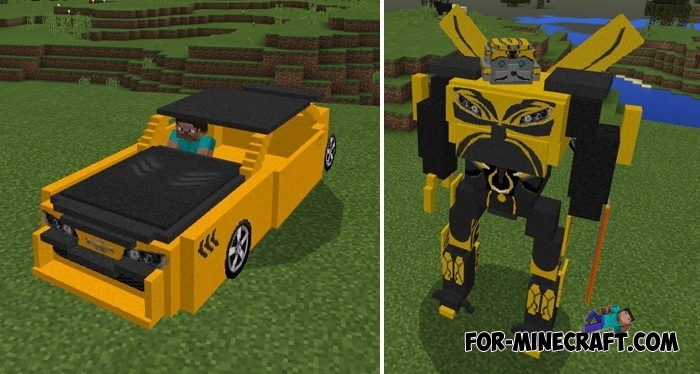 At the moment, the Transformers addon contains only six transformers that can turn into vehicles. Do not be sad if you do not find your favorite hero, now only Optimus, Blackout, Bumblebee, Grimlock, Shockwave and Starscream are available to you. All the characters are fighting and are always ready to tear each other to shreds. 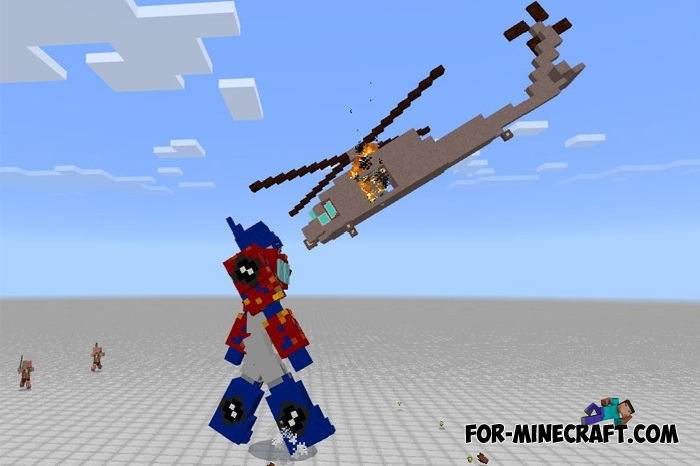 If you really liked this addon and you want to see other transformers then contact the creator - StarkTMA. Perhaps your requests will convince him to add something or someone. There are only six transformers with high parameters. They are comparable to bosses, it's better not to anger them. 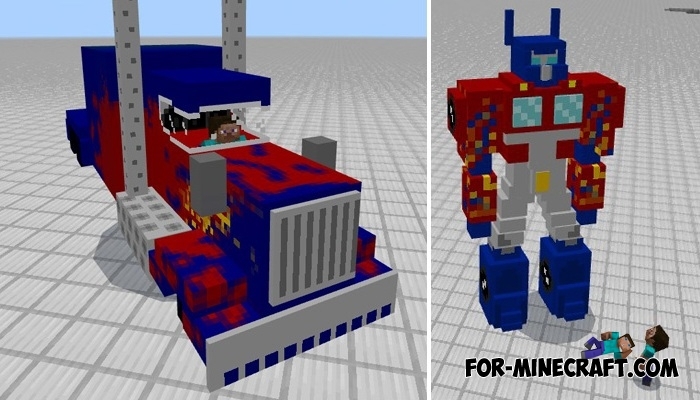 Optimus Prime fights on the side of good and will never touch people, but you are a Minecrafter so this rule does not apply to you. If you hit it, then wait for trouble and big problems. Optimus transforms into a truck and can be used as a means of transportation (the steering wheel is a carrot on a stick). To find Optimus you need to spawn golems or find a village where that transformer works as a protector. Blackout stands on the side of evil, capable of destroying you in a matter of seconds. It is a combat helicopter equipped with missiles and able to move quickly. Optimus Prime is his main opponent, you better stay away if they meet each other. Both transformers have high power and are an excellent opportunity to test your combat skills. Bumblebee has long won the love of many fans of transformers. This yellow autobot is very strong in close combat and can dexterously cope with a small group of blackouts. It is very kind and treats ordinary players and mobs well, but never touch it otherwise you will feel what pain is. Shockwave will not stop until it kills all autobots. You can easily find it in the standard world, even in remoteness from everyone. This decepticon is very aggressive, anyone will be attacked if caught in its path. If you are looking for a strong opponent, then attack Shockwave. 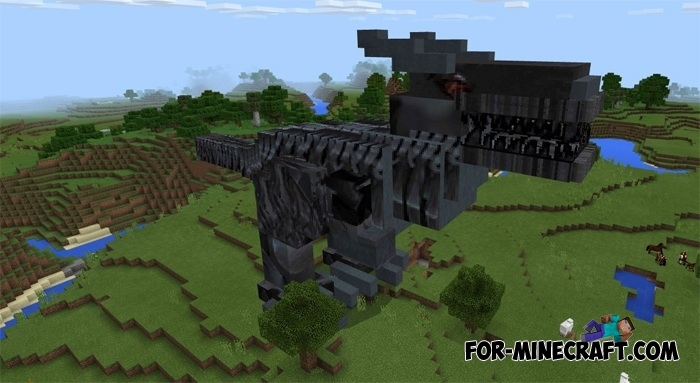 Grimlock looks very intimidating but inside it is friendly and does not attack players. Its task is to destroy desiptekons and help the autobots. It is incredibly strong and will become one of the main opponents, which is very difficult to defeat. If Optimus riding it, then this pair will become the leader in the battles. Starscream was once different and stood on the side of the autobots, but eventually joined the evil. Now its goal is to destroy all the autobots. 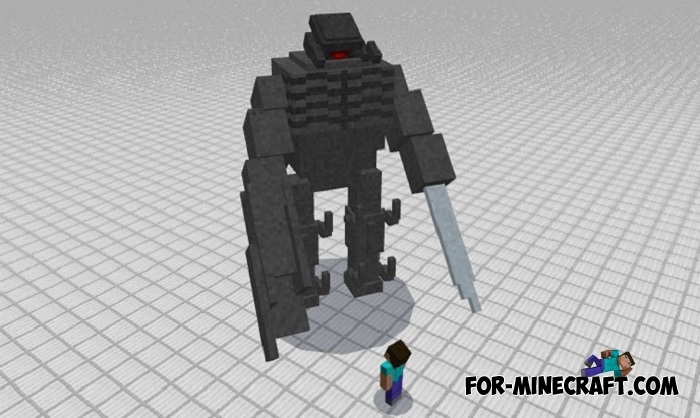 You as a simple Minecraft PE player are unlikely to cause it much damage, the autobots should do it. As one of the strongest, it can turn into a fighter plane and attack sharply the enemies. How to install the Transformers addon? 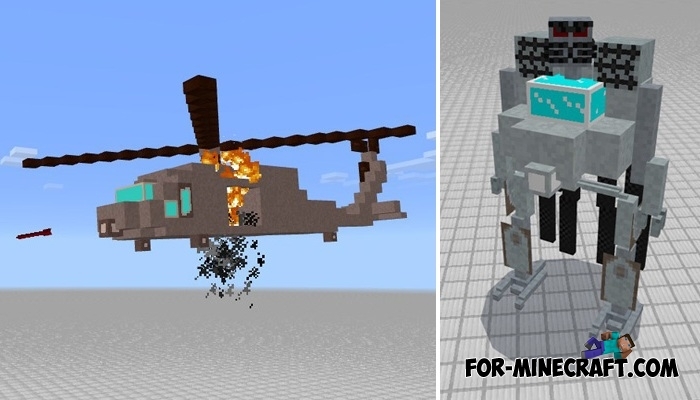 Helicopter mod for Minecraft PE 1.0.0/1.0.3 It is time for rotorcraft vehicles. Helicopter mod replaces the blazes with transport helicopter which has a fuel tank..